Jesus, Matt Teacher really likes gin. His new hardcover, The Spirit of Gin: A Stirring Miscellany of of the New Gin Revival, crams nothing but juniper-scented spirits into its 350-plus pages. Rest assured, there’s not really 350 pages of material to be revealed in the giniverse. The Spirit of Gin is breezy and light, with lots of white space and plenty of pictures. 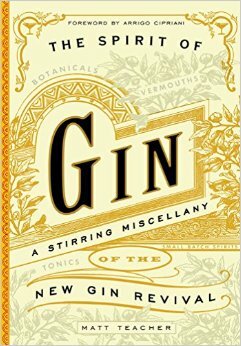 The book begins with the dutiful history of gin and some discussion of various gin distillation methods. Cocktail recipes old and new are interspersed with profiles of gin-focused bars around the world (but priumarily in the U.S.) — good old-fashioned “gin joints,” all of ’em. A full third of the book is devoted to an “incomplete” catalog of modern gins, a simple, alphabetical guide to some of the noteworthy craft gin brands out there. If your tastes run more to Caorunn than Tanqueray, it’s a section you’ll enjoy perusing to pick up a few new suggested bottles. The “Miscellany” in the subtitle is right. The Spirit of Gin is built like an encyclopedia but reads more like a coffee table book. Incredibly scattered but interesting, it’s the kind of book that is more fun when you simply open it to a random page than when you try to read it from front to back. Hey, who wants a Tom Collins? Bought this book for my dad for Christmas. His name is Tom Collens and, as long as I can remember, he and my mother have had a gin martini before dinner every night. He likes it a lot – like you said, it’s more suitable for browsing than reading.